Oracle EBSiCounting is fully integrated with Oracle E-business Suite and helps business to streamline the inventory counting within warehouse. 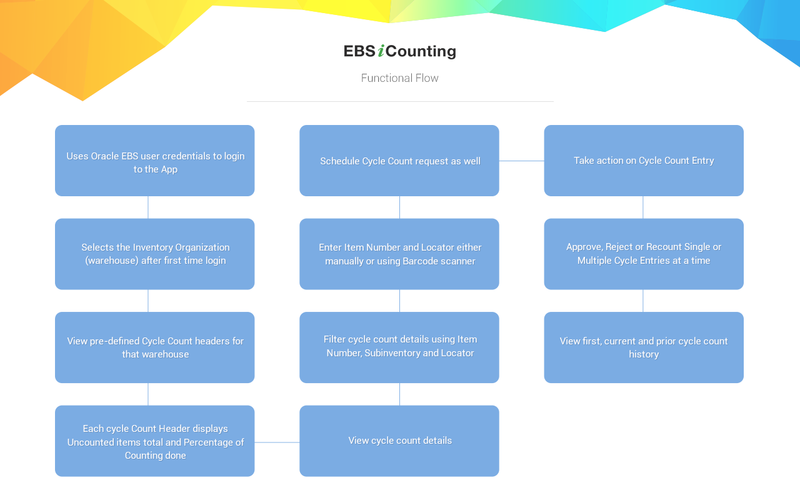 EBSiCounting allows you to Schedule Cycle Count Request, View Cycle Counting details, Enter primary and/or secondary quantity against Count Entry, take action on Cycle Count Entry. You can Approve, Reject or Recount right from your iPad. This App is flexible enough to allow user to take action on single or multiple Cycle Count Entries at a time which in turn saves time and cost. User can also view First, Prior and Current Cycle Count History of the item. EBSiCounting gives you flexibility to view Cycle Count for the Warehouse you want. User can also filter Cycle Count Details based on Subinventory, Item Number and Locator. EBSiCounting adds functionality to scan Inventory item and Locator barcode using camera. It also supports Bluetooth scanner. Provides ability to view and schedule cycle count using iPad. Also allows user to take action on cycle count entry and view its history. You can Approve, Reject or Recount single or multiple Cycle count entries on single click. You can view First, Prior and Current history of each cycle count entry on the move. Provides facility to scan barcodes using camera to get the required inputs (Item Number and Locator) to filter cycle count details. EBSiCounting is available for Free on the App store.